Doubtless too, it is expressive of class, income, status and power. It is no accident that in most – if not all countries – better-off residential areas are likely to be freer of litter than worse-off localities. They have more public clout and more private resources. Industrialised countries such as Britain and the US are rich, but they’ve embraced austerity and encouraged rampant consumerism, making them sadly notorious for being far more publicly dirty, as captured by Kenneth Galbraith’s (1958) critique of “Private Affluence and Public Squalor”. South Africa has similarly developed a culture of externalising private costs on to the public, a culture of not caring about the environment, which has been emblematic of the country’s mining industry for more than a century. For example, the expansion of the road system was accompanied by the massive expansion of white suburbia from the 1960s, where tellingly, pedestrians – many of them black domestic workers going to and from work – were denied pavements and left to walk in the road. Because the white inhabitants of suburbia were ratepayers, and because they employed domestic labour to tend to their verges, they enjoyed a generally litter-free environment. The scholarship is not available to tell us about the state of litter and waste in the townships at that time, but we may guess it was distressingly different. 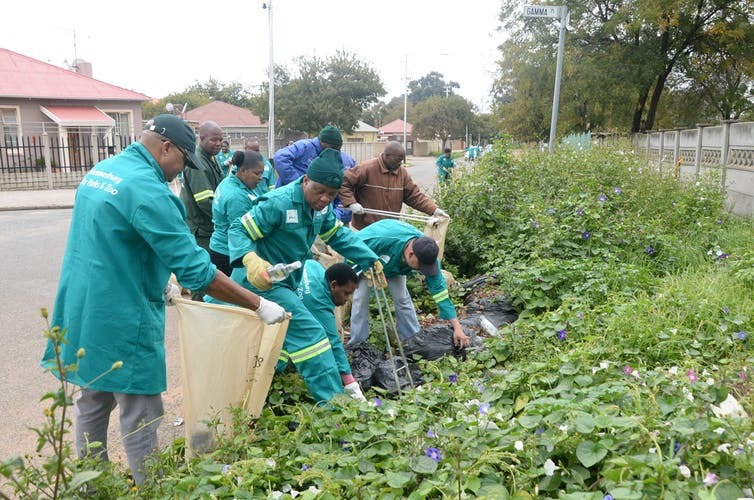 Johannesburg Mayor Herman Mashaba, second from left, joins the city’s Are Sebetseng (Let’s work) cleaning campaign. 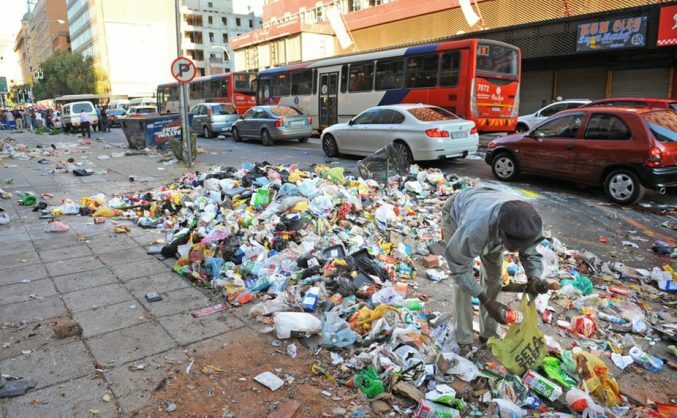 There are worries, as there should be, that the appalling littering along South Africa’s highways and the litter to be found even in many of South Africa’s beauty spots is a threat to our tourist industry, and that in turn, means fewer jobs (let alone less general enjoyment). Yet the problems resulting from poor disposal of waste run far deeper. Yes, the fast-food industry and the supermarket chains, which have a fetish for unnecessary packaging, have much to answer for. But the externalisation of production costs on to to the public is hard-wired into South African industry. South Africa is a country whose industrial origins lie in mining, and mining systematically produces massive waste and pollution, which often has hugely detrimental effects on the environment and public health. This culture continues today, sadly encouraged by lax governmental environmental supervision and excessive concern for profits, investment and private gain. “Littering” by individuals is merely the expression of a far wider selfish – and publicly, costly – culture.